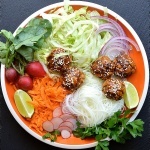 I took a few liberties in creating this composed Asian Meatball Salad. Let’s call it Asian-inspired, shall we? 🙂 I am loving these arranged salads lately and this one couldn’t be simpler! 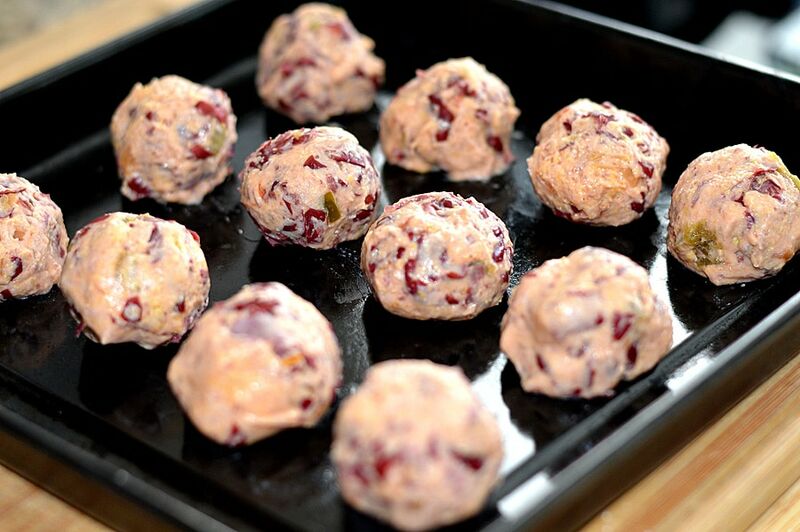 The “meat”balls are actually made from mashed red kidney beans, a vegetarian corn muffin mix and your favorite Asian salsa* (drained of any juices). That’s it! This take on my 3 Ingredient Red Bean Burgers was an experiment of sorts, but it absolutely works. The sauce I created was a Hoisin-based combination, but you could use pretty much any complementary flavor combination of salsa and sauce you prefer. For instance, a pineapple-based salsa with a sweet and sour sauce. That sounds pretty amazing, right? Mashed red kidney beans are combined with your choice of Asian salsa* (be sure to drain all juices) and vegetarian corn muffin mix. I don’t know why this works, it just does. Using a small cookie scoop and damp hands, form these little balls. They bake at 350 degrees until golden on the bottom and firm to the touch. I promise, you can’t even taste the beans. But what you can taste is a subtle corn and salsa flavors. But the star of this show is the sauce. The Hoisin sauce is comprised of rice vinegar, soy sauce, sesame oil, minced garlic, ground ginger and of course, Hoisin sauce. If you are having trouble finding the vegetarian sauce, do a Google or Amazon search and you’ll find it. Also, my grocery store readily carries the Jiffy brand vegetarian corn muffin mix, but you can also get that on Amazon. I chose to add green cabbage, red onion, rice noodles (I buy this brand in my local grocery store), carrots and radishes to my Asian Meatball Salad along with a few slices of lime. The sauce will make enough for you to toss the balls in as well as to serve extra on the side for dressing. Finally, garnish your plate with fresh parsley. These “meat”balls turned out so well, I am already planning more flavor combinations for the future! In a small bowl, prepare the salsa and allow to sit. Drain 1/4 C of Salsa. You can use either a prepared salsa or make your own. Either way, drain off any excess liquid. We will be using just the solids for this recipe. In a large bowl, mash the beans then add the drained salsa and corn muffin mix. The mixture should still be moist but easily form into balls which is made easier by using wet hands. I used a small cookie scoop to make them uniform before rolling. Bake until the bottoms get golden and they are firm to the touch. You should be able to easily pick them up with them being too fragile at this point. Coat the balls with the sauce and serve the extra on the side. Soak the rice noodles in hot water for 10 minutes. Drain well. To assemble the salad, thinly slice the cabbage, grate the carrots and thinly slice the radishes. Garnish with lime wedges and fresh parsley. Disclaimer: Please note that some of the links above are affiliate links. These look good, but what the heck is Asian salsa? I love love love your recipes (seriously, I make so many of your fritters/cakes regularly) but can you pleaseee consider including yields more frequently? I’m so bad at estimating it and I like to make a big batch of food for the week so it’s important to me to know how much to buy! I would super appreciate it. Hi Aidan, thank you for the feedback It makes me SO happy to hear you are making the recipes and enjoying them 🙂 Your wish is my command! Will do on the yields. Yummly TRIES to automatically estimate them, but they rarely get it right so I’ll try to start doing this from now on. 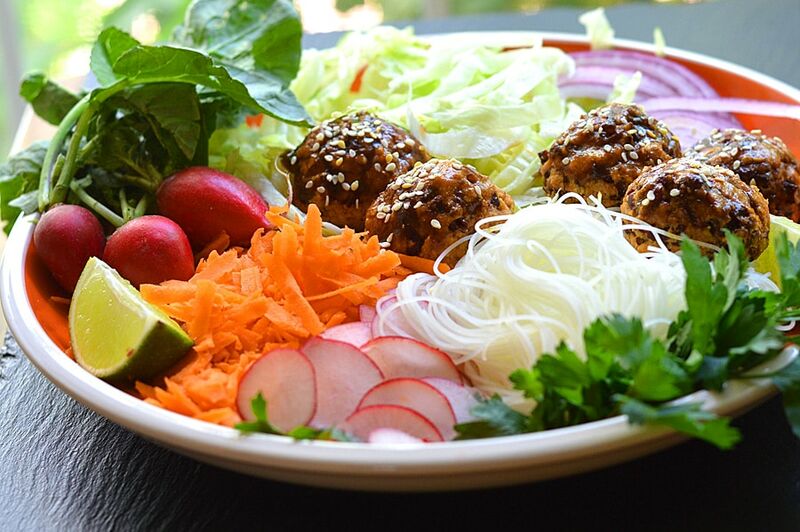 The Asian Meatball salad (salad portion) is for one person, but it makes about 12-15 “meat”balls – depending on how large you make them. I served about 5 on the salad. The rest are freezable and great in everything from spaghetti to subs. I hope that helps and thank you so much for the suggestion! My son made this for lunch today. Absolutely delicious! It served the 4 of us. If it was served to me in a restaurant, I would order it again. Thanks for making my tummy happy.